Here at Guitarless, we like parlour guitars. We like them a lot. 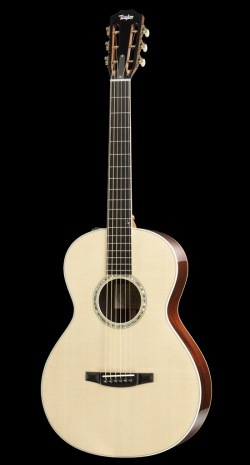 What Taylor have given us is a Sitka spruce top and a rosewood back and sides. They tell us that the sides and back are Madagascar rosewood which is denser than Indian rosewood and can therefore be milled thinner. The Sitka top is specially selected from a slow-growing stock which gives a wider grain and, correspondingly, a warmer tone. The internal bracing and even the bridge are designed to enhance the movement of the top and, therefore, the tone. Typically enough, it’s a 12-fret to the body and a traditional slotted headstock tops off the mahogany neck. The fingerboard is ebony and is unadorned, but for the 35th anniversary inlay at the 12th fret. 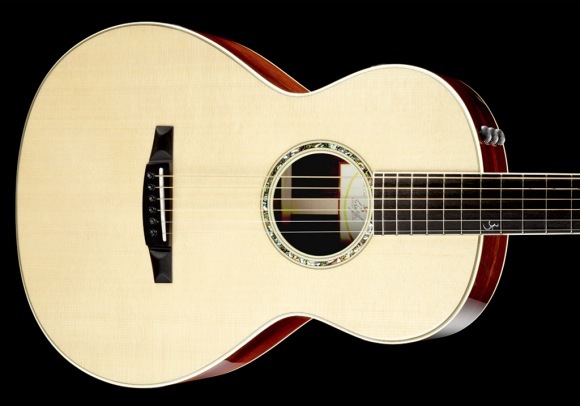 The slope-shouldered design really suits this small-body guitar and Taylor have kept the embellishments tasteful: ivoroid binding and a green abalone soundhole rosette. A gloss finish serves to protect the instrument from flying beer and the like. Not that you’d be so careless. This is a limited run guitar and it’s not cheap. Prices are expected to be in and around $5998. Phew! That’s a lot of cash. But look at it. Damn that’s pretty. Get more info over at Taylor’s site. By the way, I know I’ve alternated between the US and British spellings of parlour/parlor throughout. Taylor say parlor, I say parlour. There are more interesting things to be annoyed about.